Want to present at library events? Want to know how others go about getting speaking engagements? The basic answer is, it's who you know. Don't despair though - it's not a closed club or a clique. You very quickly get to know people by putting yourself out there, answering calls for papers, organising events yourself, and blogging so people know your views and interests. I asked people on Twitter how they got their library speaking gigs - it was a 'tick all that apply question'. A massive 69% of respondents have got speaking engagements through someone recommending them: this is the most common route. The next most common was knowing one of the organisers (59%); then answering a call for papers was next (53%). The other significant number of votes was for getting asked off the back of other speaking engagements (51%). So really, once you're in the loop, you're in the loop - do a couple of talks and the whole thing self-perpetuates and you'll probably end up being asked to do more. For a more in depth look at all this, read on. If you're professionally active and interested in librarianship beyond just your own job (and I'm presuming you wouldn't be bothering with this blog if that wasn't the case!) then you might be wondering about speaking at library events: conferences, open days, symposia, training days etc. This post discusses how other information professionals approach doing this - how do you get to talk at interesting events? Presenting is something I'd completely recommend doing, and I know a lot of others feel the same way. It's not as scary as you might think (and it very quickly gets even less scary for a lot of people), it can be really exhilarating, and it's great professional development. Presentations are an increasingly important part of many library roles, so it allows you to put a key skill on your CV. Just being on stage to talk about a subject is enough to really focus your mind on learning more about it, so you become more engaged and more well-researched as part of the process of preparing your talk. Plus of course it gets you out there, allows you to meet interesting people, makes networking a lot easier (people come up to you) and you may be able to build a reputation which leads to more interesting stuff. The most obvious way of getting yourself on a bill somewhere is to apply via a call for papers. There are loads of these across the course of the year - subscribe to the A Library Writer's Blog and Dolores' List of CFPs blogs to receive regular alerts, and eventually something relevant (and possibly local) will come up; these blogs also contain calls for book chapters and articles. Another obvious way is to join a professional body - CILIP, the SLA, ALA, BIALL, etc etc. As I've said before, it's a great way of allowing you to get involved with stuff which you might not be able to do as part of your current job (but which might help you get your next job..).
. Some provisos and caveats: 'Reputation' refers to things like being asked to present the Echo Chamber talk with Laura Woods at Umbrella, because the organisers knew of our previous talks on the topic. So I don't mean that I got booked for my reputation! Just that people knew I (or in this case Laura and I) had talked on the subject or related subject before. Also, the twitter / blog category overlaps with the reputation and the knowing the organiser categories. It's all quite fluid and not as black and white as presented above. Anyhow, clearly knowing people is useful - both organisers, and people with clout who recommend speakers for things. What often happens is that organisers of an event are organising it in their own time and they really want to get it sorted without too much fuss. So if they have a list of people they know are fairly reliable and have spoken at things before, they'll go right to that list. (There's a danger that this approach can lead to a stale or repetitive round of speakers at library events, but that's a debate for another day.) What I'm trying to say is: in a lot of cases you don't have to be the best, or the most knowledgeable, or the expert in the field - it's sufficient just to be okay at it and then people will come back to you as an easy and reliable option... You just need to take that first step on your own, and make something happen. The 8 votes for the 'other' categories were mostly what I would classify as 'Knowing one of the organisers' so in actual fact it's more of a tie between that category and 'Recommendation by someone' than is indicated above. Apologies for my slightly woolly categories, and thank you very much to everyone who filled out the survey and retweeted the link!
. So for the most part, the twitter poll mirrors my own experiences - it really is a case of the people you're in contact with being the key. That's why networking is so important (both in person and of course online). That said, I honestly believe networking is most effective if you approach it with the question "What can I do to help people?" rather than "how can I develop a network to help me?" - I know that sounds a bit twee but it really does seem to be the case that if you go out there solely with the intention of looking for opportunities, they may be slower to come to you. Just briefly here's some related info on a variety of topics. Saying no Saying no is really, really hard - particularly to exciting opportunities. But there comes a time where taking more on will actually be bad for you, because to prepare well for a speaking engagement takes time, so it's very stressful if you don't have enough hours available. It's really okay to say no, particularly once you've got a few talks under your belt - in my experience people are generally very nice about it. Referring If you can refer the organisers to someone else, do so. Don't just refer at random, but if you know someone who could do a really good job instead of you, then pass on their name and email address to the organiser - it really helps the organiser (they can always ignore the referral, but often they're very grateful) and of course someone you like may well get a great opportunity from it. I once passed on something I couldn't do and recommended someone else - the person ended up doing such an amazing job that they were way, way better than I could've been, so I was really pleased they ended up doing it! I learned more from their presentation than I would've done from researching my own. Money There are people who make good money from speaking at library events. I am not one of them. I've only ever been offered one paid key-note, and I don't mind that at all - the fact that your travel is paid for (some people will speak at events for which their travel isn't covered, but that's not something I personally do) and your attendance at the event is paid for is great in itself, because you get to attend something interesting for free. So, don't expect to get paid for a long time - there isn't a lot of money floating around in library-land, and you'll normally have to settle for doing it for expenses, for the experience, and because it's fun. Plus it helps out the organisers out. Links Elsewhere on the blog, check out this guide to submitting a proposal, and this guide to first-time public speaking, plus these polemical slides on the basic rules of presenting... There are also links to other people's articles on the same subjects, within those posts. Over to you So, any more tips for the would-be presenters out there? Please leave a comment and help expand this guide. And if anything I've said doesn't chime with your own experience, I'd love to hear about that as well. 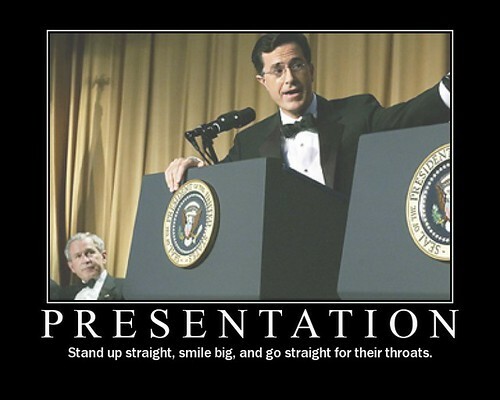 Stop BREAKING THE BASIC RULES of presenting! Incidentally, this is really aimed at people who habitually do all this stuff, without really knowing they do it. If you already know these rules, then you can probably break them and still make a great presentation! Read all the guides I've ever written (to Prezi, Twitter, Public Speaking, Evernote, Netvibes, etc etc) linked from one page.